[Updated] At approx 1:30 pm, police responded to the Cable Hill, Devonshire area to what we unofficially understand was a firearms incident. Multiple police units are on scene and Bernews understands that one person may have been injured and transported to King Edward Memorial Hospital. Details are limited at this time, however we will update as able. 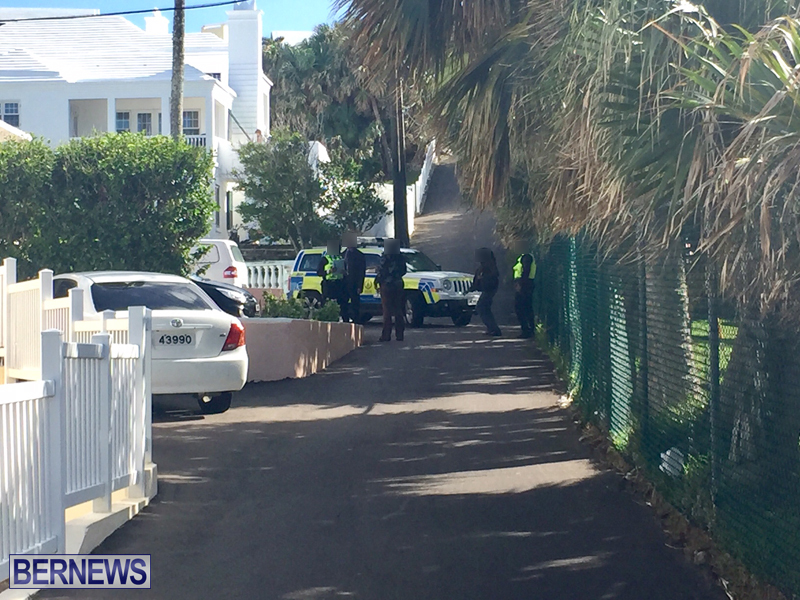 Update 3.08pm: A police spokesperson said, “Around 1:20pm today [Thursday, January 26th] police officers responded ‎to a report of a shooting in the Cable Hill, Devonshire area. “Details are limited at this time. “However, it appears that a 19 year old Devonshire man was shot and injured. “Initial information suggests that he was taken to the hospital for treatment of an arm injury, which is not believed to be life threatening. Dont worry, OBA said they would stop all this when they’re in. And the PLP/UBP said they would too…so what?! onion Juice I think you need to correct your statement, Mr. Michael Dunkley pounded the pavement every-time there was a shooting, when he was in the opposition, and Mr. Michael Dunkley assured the public that this type of behavior will not be tolerated when he and his party get into power. So I say to Mr. Michael Dunkley who happens to have held the post of Nation Security minister while also holding the office of The premier, “ARE YOU FINISH TAKING YOUR DARN PHOTO OP’S” AND DO YOU NOW HAVE TIME FOR THE CRAP THAT HAS BLOWN THE FAN RIGHT OUT OF THE CEILING. Now that Mr. Baron is the new Minister the same crap, just a different day. ” WE THE PEOPLE ARE TIRED” AND WHEN FOLK GET TIRED, WHEN YOU FILL IN THE BLANK’S. The Govt can’t fix this. you can’t fix stupid. if someone wants to kill someone they will. No govt will stop them. Ask the young man that got shot who done it. This is really sad and needs immediate addressing. What concerns me is for the past couple of years the government of the day has continually reduced the Police budget in a time when violent crime seems t remain steady. Shouldn’t the Police budget be increased t aid in combating this foolishness. this type of crime takes less than a minute, and rarely gives advance notice to the authorities. In most cases inquiries are made, the success of any inquiry depends on facts ( evidence ) obtained, witnesses, cctv footage, cell-phone records….it is a step by step process…which can be questioned at any stage and halted if the standard is not believed to be creditable.